London is a punk/powerpop masterpiece while the flip Women In Love leans more to punk. Both tracks are of course awesome. Women In Love even reminds me a bit of The Stranglers(which happens to be one of my favourite bands). 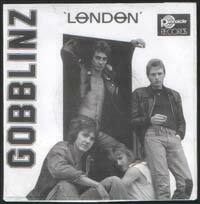 “The band soon got signed by Pinnacle and their first release ‘London’ sold well. However after a management split the Band recorded the ‘Communique’ EP which is now one of the most sought after 7″ new wave releases.“. Read an interview and listen to some rare sound clips here. NAT Records in Japan is reissuing their two 7inches this summer. This one is totally great. Took me around 20 years to get one!! You should have contacted me. I`ve got loads of them I was the keyboard player!! do you still have em? How weird, I’ve been waiting for you to post this one, and if it would take too long, I thought I’d do it instead. Turned out I was almost 9 years too late! Don’t know how I’ve managed to miss that you’ve posted it back then. No matter what it’s a great record!